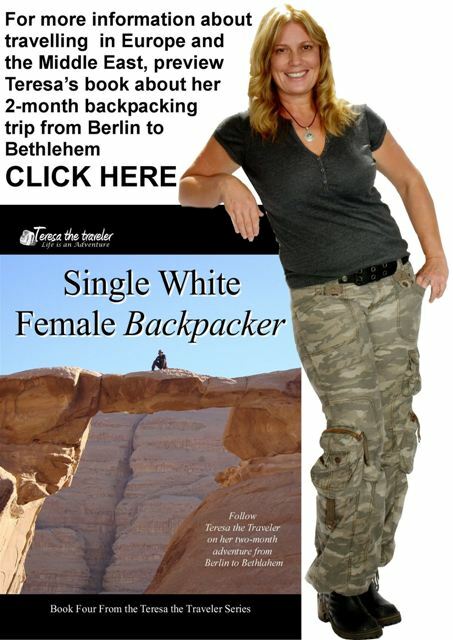 Excerpt from the book Single White Female Backpacker from the Teresa the Traveler Series. 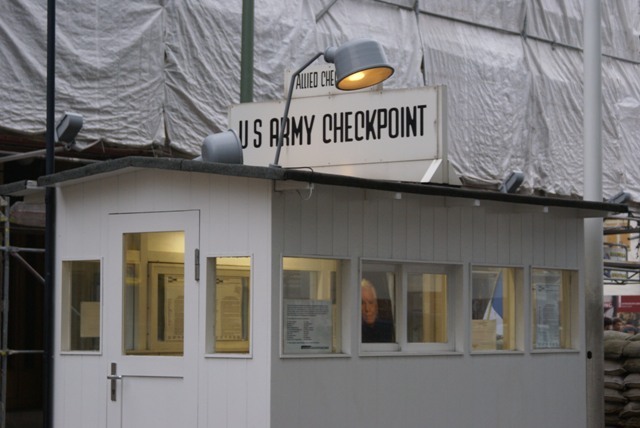 Christine had to return home the next day at 6pm so the following morning at breakfast, she asked me what sight I most wanted to see and I replied Checkpoint Charlie (the crossing point from East Germany to West Germany during the Cold War) and the Berlin Wall. I figured it would be interesting to visit these sites with Christine because she lived in West Berlin during that time. I grew up in the Cold War era, when Berlin was the focal point for the 1947-1991 battle between American Capitalism and Russian Communism. The two superpowers embarked on a nuclear arms race that resulted in over 50 years of, what was ironically called, nuclear peace. I remember reading stories about people from East Berlin formulating diabolical plans to escape into West Berlin. Some were lucky and escaped into the free world while others died in their bid for freedom. Tourists surrounded the old American sentry shack eager to get their picture taken. The metal shack from the 1980’s, which is on display in the Allied Museum, was replaced by a replica of the original 1960’s wooden shack. For one Euro, I posed with two actors in front of the shack, one dressed as a Soviet soldier and the other dressed as an American soldier. Next I jostled for a position so Christine could take my picture under a replica of the famous sign that informed people at the border they were “leaving the American sector”. 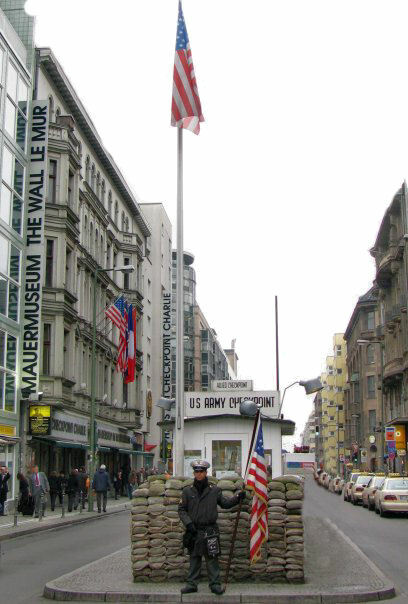 Having seen all there was to see on the street, we went into the Checkpoint Charlie Museum to learn about the history of the Berlin Wall and Cold War Germany. As a result of their defeat in World War II, Germany was divided into four occupational zones controlled by the French, British, Americans and Soviets. Berlin, which was located in the Soviet controlled sector, was also divided into four sections. The British, French and Americans were not fond of the Soviets, so they combined their sectors forming the Federal Republic of Germany while the Soviets formed the German Democratic Republic. 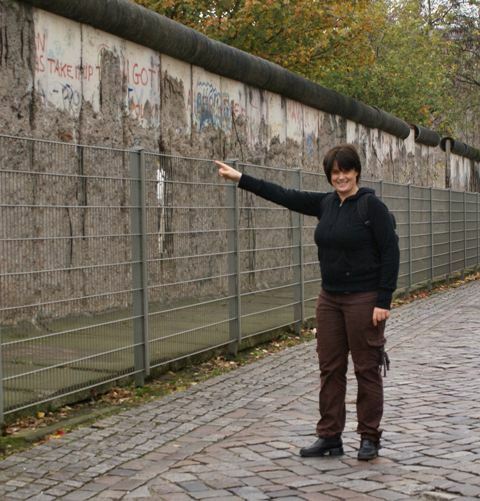 As time went on, the two sides failed to get along, so the Soviets built a huge wall around West Berlin to stop Westerners from corrupting the minds of the Easterners. They also wanted to stop Easterners from moving into the West to escape the regime. Construction of the wall, which at first only consisted of barbed wire,was started by East German troops at midnight on August 13th 1961. Streets along the border were torn up so cars could no longer pass and soldiers patrolled the border with orders to shoot anyone who tried to cross. East Germans were no longer allowed to travel or immigrate to West Germany and numerous families were virtually separated overnight while East Berliners working in West Berlin lost their jobs. The wall, which followed political borders not natural borders, ran straight through buildings and houses. Can you imagine waking up in the middle of the night to discover that half your house is now in West Berlin while the other half is in East Berlin? What if your bathroom was in the west and your bedroom was in the east and your spouse got up to pee just before the house was divided? Talk about bad luck…unless you were thinking about divorcing anyway. At least you wouldn’t need to hire a lawyer. So many people escaped into West Berlin through these boarder buildings that the windows were boarded up and the smaller houses were destroyed. The wall was built in four stages. Shortly after the installation of the wire fence, a second parallel fence was constructed 91 meters away. The area between the fences was referred to as “no man’s land”. Houses between the fences were torn down and the inhabitants relocated. The strip was paved with raked gravel so footprints could easily be detected. Not only was it booby trapped with trip wires, it offered a clear view for the guards who were ordered to fire at anyone trying to cross. Despite their best efforts, they could not build a wall higher than the human desire for freedom and throughout the years, people found numerous ways to escape. 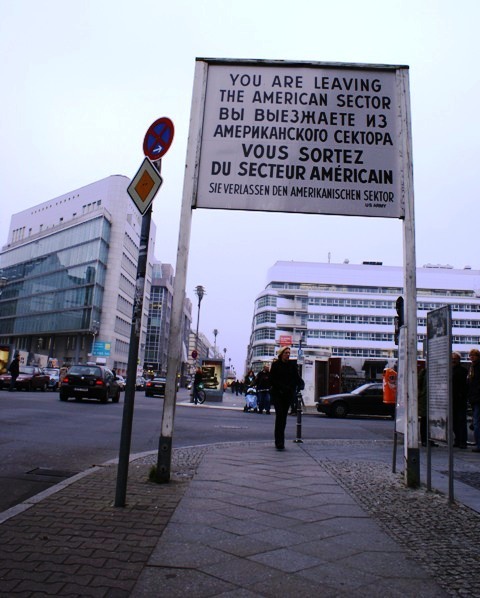 Around 5000 East Berliners managed to successfully overcome the wall to find freedom in the West. Comfortable rooms with T-Mobile wireless internet and breakfast optional. 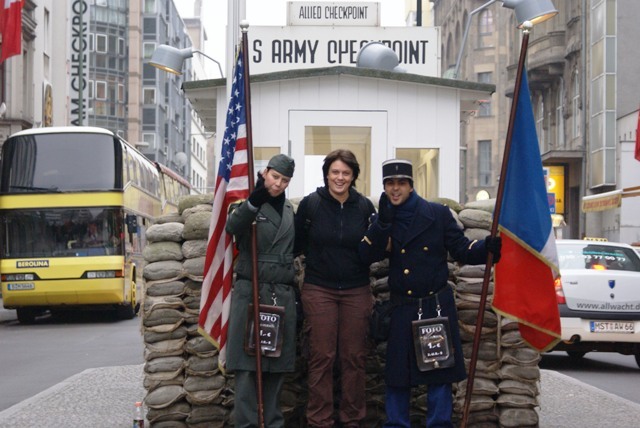 Within walking distance of Checkpoint Charlie, Brandenburger Gate and the Reichstag.